DISCLAIMER: I am not, nor are other contributors a financial advisor, nor do I/we play one on TV. The information provided herein is not financial advice and is only meant to be used to share information. None of the above should be considered a substitute for any type of financial advice. Please consult your own financial advisor for advice on the risks involved in trading. This week will equal time from the election low that originally tagged the January 2018 high. We have other confluences of time that have extended by a week or so up here too. There are plenty of divergences from the daily all the way down but as we all know it just continues to gap and go at will. Divergence in place yet, will it change? Had to test this top eventually, can we make the higher high? Perhaps just another set up like September / October highs? I noticed ES got the Friday afternoon carry over and that afternoon move surprised me just a touch this past Friday. I can't help but think this immediate term top is in. Can it be retested? Sure, but now I think a few other charts may have a say as to how long it could be prior to it happening. 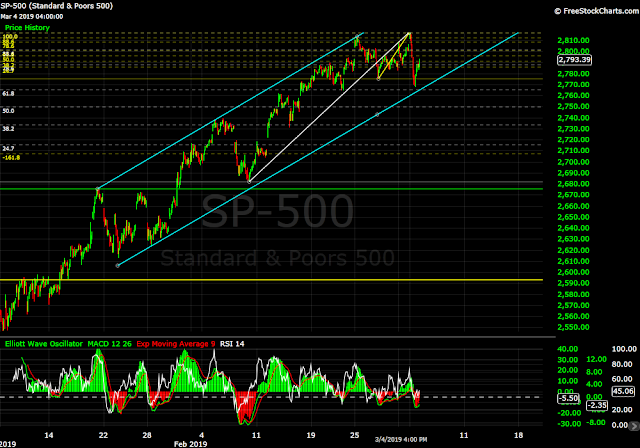 A break on SPX at 2722 (March 8 low) would certainly signal a trend change. I will leave this space for the SPX and RUT but will post a few others in the comment section. SPX / ES / VIX pretty much hit all the initial profit targets of the short that was playing out in the immediate term. Off those PT's it managed a bounce and seems it still wants to climb a bit more. On the SPX it seems the 2767-68 price is pretty key and if they intend to keep the current bounce alive I would think this is where bears have to respect price. Quad Expiration coming up on Friday so about all we can do is respect the chart and what it is telling us. You guys already know I am expecting a little weakness here yet to start the week so I would think what we see in the morning will let us know. I will post a couple more charts below along with the standard typically put here. I went ahead and just did something in the immediate term with some Murrey levels. Good luck and let's keep 'em Green! So far it appears the bulls remain in control. A bit of damage done yesterday but in reality it short profit targets were hit. ES says short lives pretty much at 2800 but bulls need only control 2787 in the current trade. Gonna keep it short and simple and just have to trade what they give us from a daily perspective. I will say it seems change in trend could be upon us based on the outside day and having taken back everything it had achieved over the last couple weeks. The low after the release of minutes was tested and that is where bears have to start, break it and bears can start winning. What can I (we) say? It is what it is. The next natural is 2809 and we are nearly there for the most part. Provided a little resistance before but let's face it, thinly traded up here. 3 months to get a low and wipe it out in 2 (for the most part). Looks almost too comfortable doesn't it? I haven't had all the time I need to study charts but it appears we are near that inflection point. With the release of minutes today perhaps this is the "news" needed to get something started. MACD is in territory it just doesn't belong in as it proved last January. Will look deeper into things as time allows this morning. I am only running on the 2G portion of my router vs the 5G so things aren't up to the expectations I am familiar with. I hope to get this resolved today. KISS is on the agenda for the week. 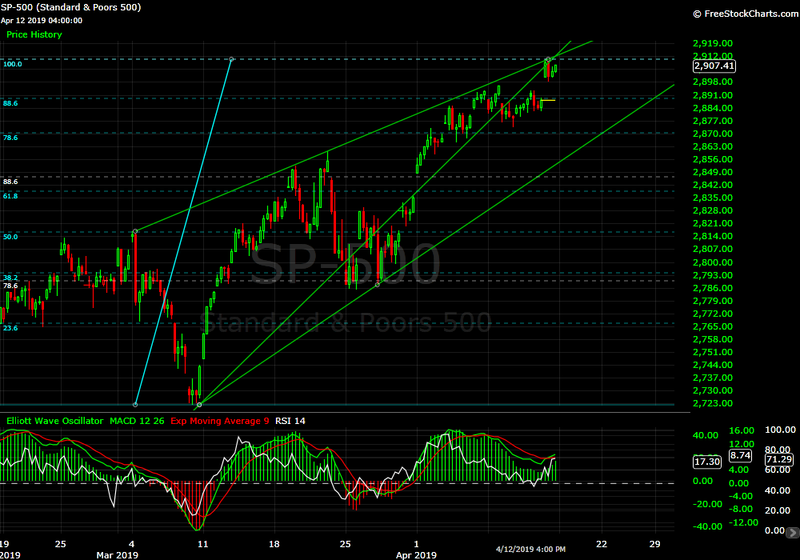 It just seems obvious we will need to retest that 2739 before anything more dramatic is going to happen. On Friday we were able to tag one of the lesser profit targets for the short that was in play. It seems the 2018 playbook is still in operation where ya run the longs, then the shorts and make a healthier decision on direction. Opex happens to be this Friday so I believe it is intelligent to let the chips fall where they may. This has been a helluva run and I can't ignore how overbought the MACD is. It is at the highest level we have seen since January 2018. Nothing found on this blog is meant to be considered trading advice or a recommendation for a trade. Please consult your own financial advisor before making any financial decisions. ©200ma. Picture Window theme. Theme images by alacatr. Powered by Blogger.